Business Hatchery is a shared space, suitable for new start-ups having 1 to 3 employees. 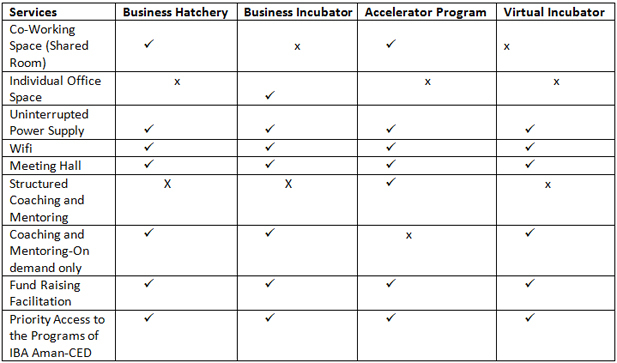 Business Hatchery is a combined space for the ventures which are starting from scratch. There are multiple desks available in a hall and one startup can use one or two desks as per its requirements. One table and chair is provided for one desk along with wifi & un-interrupted power supply. The main objective of Business Hatchery is to provide the basic facilities to the entrepreneurs which are essential for starting a venture from the scratch. Business As it provides shared space to small start-ups; hence the entrepreneurs can learn different things from each other as they are at the same level of operations. The startups will be given assistance in management, marketing, fund-raising, and connect them with the industry experts of their business areas. Once the startup has grown its roots then it can be offered a relatively larger and private space in Business Incubator. IBA-Business Incubator is a facility comprising of different size of rooms for startups who have launched their business and made a team of 4 or more. IBA Business Incubator is aimed to provide the physical, technical and soft assistance to the emerging ventures. Physical assistance consists of rooms, furniture, and IP Phone. Technical assistance is comprised of mentoring and consultancy tailored to the needs of the ventures. The soft assistance involves the facilitation for their fund-raising campaigns, and the capacity building activities i.e organizing workshops and seminars etc. Technical and Soft Assistance are available on-demand. IBA Business Incubator targets those ventures who have laid a solid base in their business area but still need the services of Incubator at bigger level. Usually these ventures have 4 to 20 employees. Incubator also targets the small companies which are stagnant and need some special assistance to find a new direction of growth. CED Accelerator Program (CEDAP), a venture support initiative by the CED, aims to create an environment in which entrepreneurial ventures can flourish and help stimulate Pakistan’s economy at large. The program will facilitate start-up ventures to grow fast by providing necessary mentoring from established entrepreneurs or/and IBA faculty with or without vested interest in the success of the ventures, seed funding, infrastructure, environment and access to IBA network. The entrepreneurs will go through a rich experience of launching a new venture. CEDAP provides a community and educational support to strengthen the entrepreneurial abilities and improve the chances of success of young entrepreneurs – with their current and future ventures. This is accomplished with a collaborative effort – the CEDAP ecosystem – consisting of CEDAP participants, leaders, mentors, and invited guests. CEDAP ecosystem engages and inspires its participant, to allow them to make meaningful progress with their venture, and to help them become a more experienced, knowledgeable and confident entrepreneur. In addition, we offer several opportunities to expand their network. All those applicants who do not need any physical space from IBA Aman-CED for their office use but need other services to grow their ventures fall into virtual incubator’s category. Virtual incubatees can access technical and soft assistance of IBA Aman-CED.